You are currently browsing the category archive for the ‘Parenting’ category. Whether you’re a parent, a leader, a teacher or anyone else in a position of influence, it’s time to catch the people around you doing something right. It’s easy to catch them doing something wrong. To focus on the negatives. But is that really the best way to positively impact and motivate others? We outsource a range of tasks in our household. We have a cleaner who comes in once a fortnight to clean up the mess that our three kids and two dogs make. We outsource the education of our kids by paying for a school to give them a quality education that is aligned with our values. We outsource coaches to teach our kids how to improve at football, basketball, netball, gymnastics, piano, athletics and cross-country running. But we can’t outsource the important task of parenting. With the kids back at school this week and all of their after school activities starting as well, our household quickly becomes a blur of activity. As a consequence, we try to make sure that we have breakfast together as a family so that we can start the day right. As a part of this ritual, we read the bible, ask a question, go around the table so that everyone gets a chance to answer and then pray together. It’s a simple process that helps us to get to know each other better, establish important principles and build positive and resilient mindsets for the day ahead. I’m so proud of my 9 year old daughter, Madison. She’s full of life, a real go-getter and has more energy than any 9 year old girl should have. But I have a concern. In a world that continually praises or criticises women purely on the basis of looks, I want her to be defined by more than her physical appearance. So if you want to complement her, please don’t say that she is pretty or beautiful (although in her dad’s unbiased opinion, she is). Complement her on her intelligence. “You know what makes me sick to my stomach? When I hear grown people say that kids have changed. Resilience is one of the most important traits that successful people have. But none of them were born with it and none of them obtained it by sitting on the bench. They built it by falling over and getting back up again. They built it by failing and realising that it wasn’t the end of the world. They built it by not allowing the harsh words of their critics to seep into their souls. They built it by doing the hard things that they didn’t want to do, because they knew that it would be easier the next time. There are few better experiences than sitting on the couch with one of my kids, with my arm around them as they read about Venus fly traps, sea otters, Captain Underpants or any one of a hundred random things. To help them with the difficult words. To hear the inflection in their voices. To explain the concepts that don’t make sense to an 8-year-old. To see them looking up for approval. Karen and I have three wonderful kids who are growing older before our very eyes. Hayden is 11 early next year and Madison and Logan turn 8 on Monday, yet it still seems as though it was yesterday when we were holding their tiny frames in our arms. As we look ahead, there are certain things that I want our kids to inherit from us and they don’t include large houses, fancy cars or fat bank accounts. 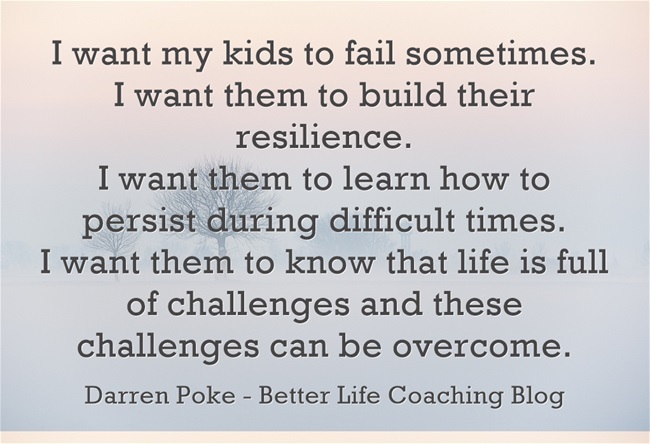 I don’t want my kids to win every basketball, football or soccer game. I want them to occasionally play against kids who are much bigger than them in an unfair match-up. I want the referee to get it wrong with them sometimes. I don’t want them to get 100% for every spelling or maths test. I don’t want them to master every piano piece on the first attempt. 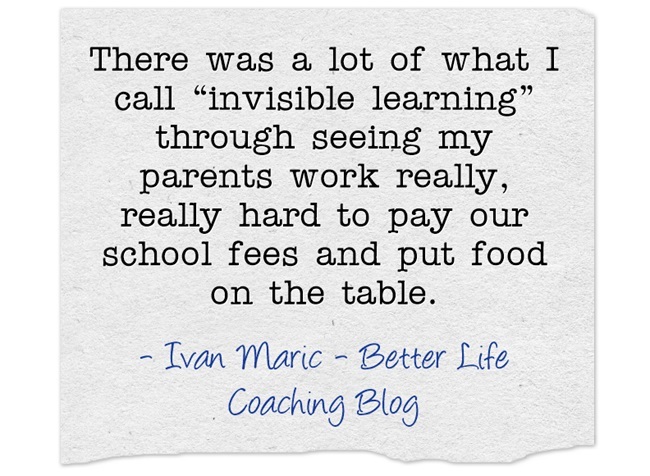 What Are Your Kids Invisibly Learning From You? What a great phrase. Invisible learning. You can tell your children about the value of hard work and discipline, but it’s how hard your kids see you work that matters.